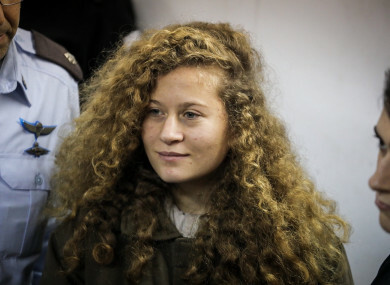 File photo of Ahed Tamimi attending a hearing at the military court of the Israeli-run Ofer military prison in the West Bank city of Beitunia. A PALESTINIAN TEENAGER charged after a viral video showed her hitting two Israeli soldiers in a case that has gained global attention went on trial in military court today in closed-door proceedings. So the way to keep it out of everybody’s eyes is to close doors and not allow people inside the court for her hearing. Her father Bassem Tamimi waved to her from the audience, yelling out “stay strong, you will win”. Tamimi’s mother, Nariman, and cousin Nour (20) were also due to go on trial later today. It was not clear whether those proceedings would take place as planned. Ahed Tamimi and her mother have been ordered held in custody until the end of the proceedings, while her cousin has been released on bail. Amnesty International has called for her immediate release, saying her “continued detention is a desperate attempt to intimidate Palestinian children who dare to stand up to repression by occupying forces”. Ahed Tamimi’s family says the 15 December incident that led to the arrests occurred in the yard of their home in Nabi Saleh, near Ramallah in the West Bank. Twenty-three Palestinians have been killed since Trump’s declaration on 6 December, most of them in clashes with Israeli forces. Two Israelis have been killed since then. Email “Journalists ordered to leave courtroom in trial of Palestinian teenager accused of hitting two Israeli soldiers”. Feedback on “Journalists ordered to leave courtroom in trial of Palestinian teenager accused of hitting two Israeli soldiers”.